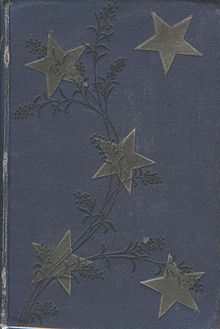 First edition cover for "The Merry Men and Other Tales and Fables" printed by Chatto and Windus 1887. "Olalla" is a short story by the Scottish novelist, poet, essayist and travel writer Robert Louis Stevenson. It was first published in the Christmas 1885 issue of The Court and Society Review, then re-published in 1887 as part of the collection The Merry Men and Other Tales and Fables. It is set in Spain during the Peninsular War. The story is based on a dream that Stevenson had and in his 1888 essay "A Chapter on Dreams" he describes the difficulties he had in fitting his vision into a narrative framework. Stevenson wrote the story at the same time as he was proofing "The Strange Case of Dr Jekyll and Mr Hyde" (published 1886). The story is told in first person by a nameless Scottish soldier. He is recovering from his wounds in a Spanish hospital, where his doctor suggests he take up temporary residence with a local family, but with their stipulation that he remain a stranger to them. The once-noble family consists of a mother, a son (Felipe) and a daughter (Olalla). The Scotsman is welcomed by the son and begins to develop a casual friendliness with the mother. Both are described as "stupid" and "slothful" but the narrator emphasizes the simple pleasure of their company. Some time passes without sight of Olalla and when she finally appears, our hero falls desperately in love with her, and she with him. He recognizes an extraordinary intellect in the girl and expresses a desire to take her away from the decaying home of her kinsmen. They profess their love for each other, but Olalla urges the Scotsman to leave at once, keeping her always in his memory. He refuses, and during the night he breaks his window trying distractedly to open it. The shattering glass cuts his wrist and he applies to Olalla's mother for help. At the sight of his wound, she leaps upon him and bites into his arm. Felipe arrives in time to wrestle his mother away from our hero and Olalla tends to his injuries. He leaves the residencia very shortly thereafter, but lingers in the nearby town. He is sitting on a hill beside an effigy of the crucified Christ when he meets Olalla for the last time. She tells him, "We are all such as He," and states that there is a "sparkle of the divine" in all human beings. "Like Him," she says, "we must endure for a little while, until morning returns bringing peace." At this, the narrator departs, looking back but once to see Olalla leaning on the crucifix. "Olalla" contains many of the trademark elements of Gothic fiction. There is a once-proud family of failing nobility, a lonely home in a mountain setting and a preoccupation with death and decay. Stevenson also focuses on the subject of heredity, demonstrated by a family portrait to which Olalla bears an uncanny resemblance. This was a very popular Gothic device, famously employed by Sheridan Le Fanu in his short story "Carmilla" and by Sir Arthur Conan Doyle in the Sherlock Holmes novel The Hound of the Baskervilles. "Olalla" has been variously interpreted as a vampire story  and does contain some familiar tropes, such as the red hair of Olalla and her mother and their deeper voices. However this interpretation is ambiguous; where vampires are very traditionally noted for their strength, daylight restrictions, and need to feed, this story touches little on these conventions. Rather, due to centuries of inbreeding brought on by the exclusive nature of noble lineage, as well as increasing isolation, Olalla's family has "impure" blood. The scene in which the Scotsman has deeply cut his hand and is attacked in a hysterical blood-drinking fashion by Olalla's mother does indeed ring of vampirism. However, the story makes clear that the Scotsman regards this as the basest of animal behavior and does not ascribe any supernatural causes. ^ a b Melville, David. "The Bottle Imp". The Bottle Imp. Retrieved 2016-11-12. ^ a b "Robert Louis Stevenson and the Strange Case of the Spanish Vampire - English and Drama blog". blogs.bl.uk. Retrieved 2016-11-12. ^ Wasson, Sara-Patricia (2010). "Olalla's legacy: twentieth century vampire fiction and genetic previvorship". Napier University Research Repository. Retrieved 12 November 2016. This page was last edited on 19 August 2017, at 19:26 (UTC).